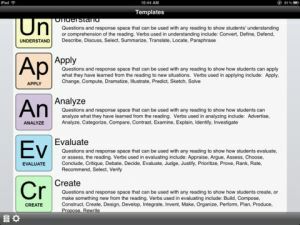 Organized according to Bloom's taxonomy, this versatile app provides student response forms that are applicable to any piece of literature, movie, or text available. Perfect for the fourth to twelfth grade classroom, the forms can be student-choice or teacher-directed. Teachers can do group instruction by projecting and completing a form through a projector or mirroring application. Model how to do a form in front of the whole class and then assign it to an individual or small group. * Can be used with textbooks, novels, app books, poetry, film, presentations - anything one reads or listens to. 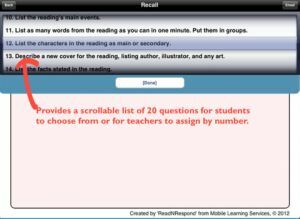 * Request students complete the form of their choice then email it to the teacher after reading each section or chapter. 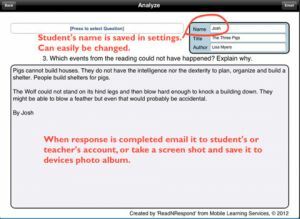 * Assign any task under Create to support a demonstration task or project-based learning. * Support student-led instruction and have students choose the field and the task they wish to accomplish. 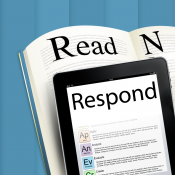 * Have students complete one question from each field as a comprehension assessment of their reading. * Use the forms as a group activity in lit circles. * Complete first as a draft then email another student or the teacher for editing. All completed forms are saved until they are written over or you may wish to instruct students to habitually erase their completed forms after emailing so other students can be presented the same form again as a blank slate. New products added to the Other MLS Products area. Print support to Air Print printers. Esta aplicaci�n permite crear bater�as de preguntas sobre un determinado tema. Lo mejor de ella es que permite tantos tipos de preguntas como �reas tiene la Taxonom�a Bloom. De modo que podemos crear formularios para crear, evaluar, analizar, aplicar, comprender. En el aula, puede ser �til para que evaluar la lectura comprensiva de los alumnos. Pero tambi�n, para proponer todo tipo de pruebas. Ideal tambi�n para trabajar en grupos con los alumnos.